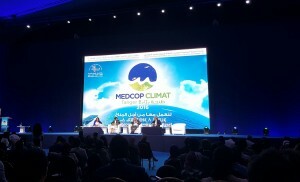 The challenges and opportunities involved in the fight against climate change in the Mediterranean Region were discussed at the second Med COP Climat event in Tangiers. The event, which took place on 18-19 July and was organised by the Tangiers-Tétouan-Al Hoceima Region, gathered together over 2,000 stakeholders, including members of the CPMR Intermediterranean Commission and representatives of the Murcia, Peloponnese, Catalonia, Valencia and Shkoder regional authorities. Local authorities, research centres, NGOs, and Mediterranean and international institutions and networks, including the Union for the Mediterranean, World Bank and UN Women, also attended the two-day event. Attendees took part in a number of plenaries, workshops, and stands such as the one from the Medina of Solutions, all revolving around climate change issues and potential opportunities to limit the impact of economic and anthropic activities on climate. This included discussions on the development and use of renewable energies, and the involvement of women in these initiatives. The CPMR Intermediterranean Commission, which outlined its commitment to climate change in a Declaration on 1 July at its annual meeting in Venice, took part in the event. The Commission was involved in a workshop organised by the Region of Murcia and the Climate Unit of the Union for the Mediterranean, targeting the decarbonisation of maritime transport in the Mediterranean. The aim was to identify the main challenges and key stakeholders that need to be mobilised in this fragmented sector. The debate underlined several key points such as the necessity of identifying and gathering leading partners from different areas of the sector to look at potential solutions. They also stressed the need to enhance knowledge on the impact of maritime transport on ecosystems and populations in the Mediterranean, as well as its lands and territories. It is hoped that mobilisation of these leaders will provide an opportunity for a multi-level technical and political dialogue, ensuring future decision-making on the basis of actual research and data. The IMC-CPMR, in the framework of its working group on “Transport and Integrated Maritime Policy”, will follow up on these discussions thoroughly. Finally, during the closing of the Med COP Climat, a Charter for Climate governance of Mediterranean territories was introduced and presented to the participants, underlining the will of “Presidents of Regions and Mayors of Mediterranean cities, and of large networks of local authorities” to collaborate together, develop efficient actions, and secure the Mediterranean as a focal point in the fight against climate change. The COP22 (Marrakech, November 7-18, 2016) will offer the opportunity to transfer the MED COP Climat messages to a global level, feeding Mediterranean discussions and experiences into the worldwide fight against climate change. The next Med COP Climat is planned for Sicilia in 2017.